This week a gaggle of giants (like a gaggle of geese, right?) took to London to visit Social Day UK and hear from loads of industry experts on the topic of, you guessed it… social media. Alongside Giant Campus, we sent three giants to hear what’s new in the world of social media. One of these giants, Amber (that’s me!) is going to round up our time at #SocialDay18. The well-attended event spanned three days and saw an almost uncountable amount of speakers and social media posts. There was so much to choose from over the span of the event, so much so that they even had to have two different streams of talkers on the second day! We heard from some local Kent based people such as the Knowltons and Molly Wright, but also got to hear from some of the awesome team from Facebook, Instagram, Snapchat, Social Media Examiner and ContentCal+. What a treat! Rather than raving on about how awesome everyone was – because they were – I’m going to share some of the key insights we gained from hearing everyone speak. 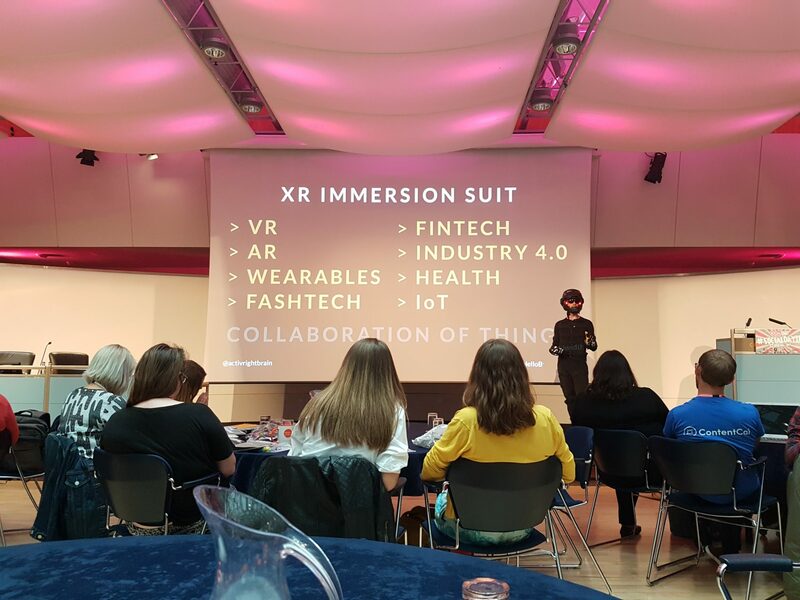 The first day started with Dean Johnson from Brandwidth who wore quite the outfit; an XR immersion suit with a flamethrower attached to his wrist… as you do. There was a surprise appearance from Snapchat who shocked the room by telling us that 80% of their users are 18+. Snapchat set about debunking the myths that it costs a fortune to run advertising with them and so much more. Consider us inspired, we’ll definitely be reassessing the platform’s potential. On day two, Ian Edwards from Facebook spoke about all things Instagram, sharing a variety of insightful facts and figures. 50% of accounts that people follow aren’t friends or family, but rather they’re influencers or products/companies they’re interested in. Now, I don’t know the average amount of accounts people follow (if you do, please enlighten me), but I have a feeling it’s relatively high. That 50% leaves quite a lot of space for businesses to get in front of potential consumers. Harry Hugo from The Goat Agency did, however, during his influencer marketing talk, mention that the average person follows 11.5 accounts from each community, such as 11.5 makeup accounts, 11.5 Liverpool FC accounts… so I guess we’ve got that to compete with! Ian spoke about the wave in brands that no longer wait for consumer need before producing a product, but rather predict it, make it and market it anyway. They rely on discovery of such to fuel an action – and this seems to be working for many brands. He also covered placement optimisation within Facebook and Instagram, discussing which would see an increase in conversion and reach with better return on ad spend. One of my favourite moments from the second day at Social Day was during the Influencer Marketing panel where Elliot Willis from The Hook Group, alongside his other panellists, did a smashing job. But what I enjoyed most was his colleagues sat next to me fangirling at every question he answered – we do the same at events, so it’s nice to see such a great team dynamic. I also got to sit in on a panel about live video, hosted and discussed by the people from the guys from The Content Marketing Association. Here they explained the benefits of live video with regards to jumping on trends. There are no expectations when it comes to production value for these kinda things either. As with most things, it’s quality over quantity. But even the word quality can be used loosely here as they explained the quality of the video doesn’t matter, just the content within it. Live streaming on Instagram is “like a big Skype chat with just one microphone” ???????????? Our last day at Social Day was equally as great as the others, but we did leave sad and wanting MORE! We heard from the VP of Twitter who spoke about the business and its successes. All the important questions were asked by the audience too, such as will we ever get an edit button for Tweets? This was met by a round of applause from the audience and Bruce telling us it’s something that gets considered every year. It all comes back to the platform being a trustworthy and reliable news source though. Then we got to hear from the Social Media Editor-in-Chief for McDonald’s, William Bonaddio, on the positive results of real, genuine content that resonates with your target audience. He told us that 97% of brand mentions are not on your channels! It’s very important to keep track of what people are saying about your business. We have had an amazing couple of days in London. A massive thank you to Lucy and Stuart of Avviso Media for throwing such an amazing and inspiring event. We highly recommend attending next year, you really won’t regret it. Can’t wait for the next digital marketing talk in your area? Sign up to our GIANTtalks and keep ahead of the digital curve.